PlexiDor extra-large wall mounted dog door provides easy access for your pet! PlexiDor wall-mounted dog doors are professionally engineered and manufactured in the U.S.A. from quality materials for the optimal comfort and safety of your dog - and of course, to be long-lasting! All PlexiDor pet doors are backed by a 90-day satisfaction guarantee and 10-year warranty! All PlexiDor extra-large wall mounted dog doors come complete with interior pet door frame, exterior pet door frame, door panels, steel security plate, 2 keys and 4-way lock*, door tunnel (designed for walls up to 12" thick), stainless steel hardware, and are backed by PlexiDor's industry leading 90-day satisfaction guarantee and 5-year no-hassle warranty! All the premium features you expect in a quality dog door - industry leading draft-proofing and energy efficiency, keyed lock, sturdy aluminum frame, concealed hinges, thermo-pane acrylic panels, and unsurpassed 10-year warranty. Available in 3 standard and 6 designer colors to suit every home and pet! Versatile - Unique twin panels need only light pressure to open them, so large and medium pets can use the same door. 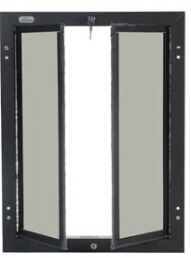 includes interior pet door frame, exterior pet door frame, door panels, steel security plate, 2 keys and 4-way lock, door tunnel (designed for walls up to 12" thick), and stainless steel hardware.